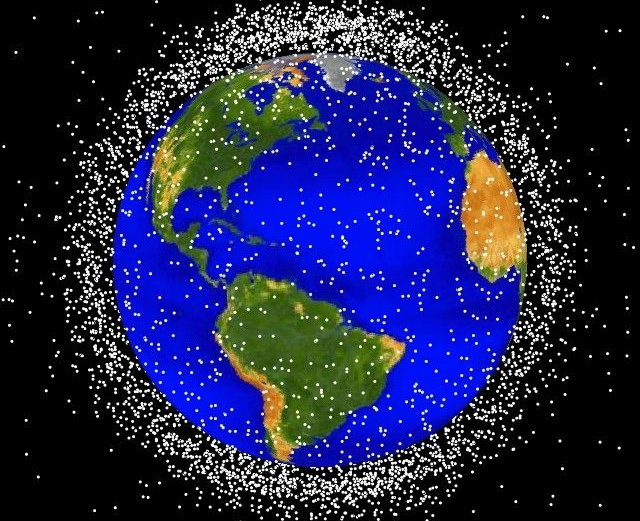 According to scientists in the US, there’s so much garbage floating around in space that if it’s not dealt with soon it could damage spacecraft or wreck important satellites. Now when we say garbage, we’re not talking about discarded milk cartons and candy wrappers that have somehow found their way into orbit. This garbage, otherwise known as space junk, consists of old boosters, long-forgotten satellites and masses of tiny fragments. The National Research Council, which has just published a report about the problem, has warned NASA that the matter has to be addressed because the situation is now at tipping point. Incredibly, there’s so much of the stuff that even the International Space Station has to sometimes dodge out of the way of it, with a potentially damaging collision almost happening as recently as June. And when you learn that the junk moves at speeds of up to 17,500 mph (28,164 km/h), it’s not difficult to imagine the kind of damage it could do. According to Donald Kessler, who studied the space junk issue for the National Research Council, the situation has been exacerbated by two major events in the last four years. The first of these was in 2007 when a decommissioned weather satellite was blown up by China as part of an anti-satellite weapon test. The explosion caused the destroyed satellite to fragment into more than 150,000 pieces. Then in 2009, a collision between two satellites added further to the mass of orbiting debris. The National Research Council, which claims the orbiting mess “is raising the risk of spacecraft failures,” has suggested the introduction of international regulations to prevent the build-up of even more junk. On the subject of clearing the garbage, the report mentions the use of enormous magnetic nets and umbrella-shaped devices that could either push the debris closer to Earth, where it would burn up, or further into space, away from orbiting satellites.